I’m addled after adding buttons, lables and a handle to some raw fleece and merino bags! 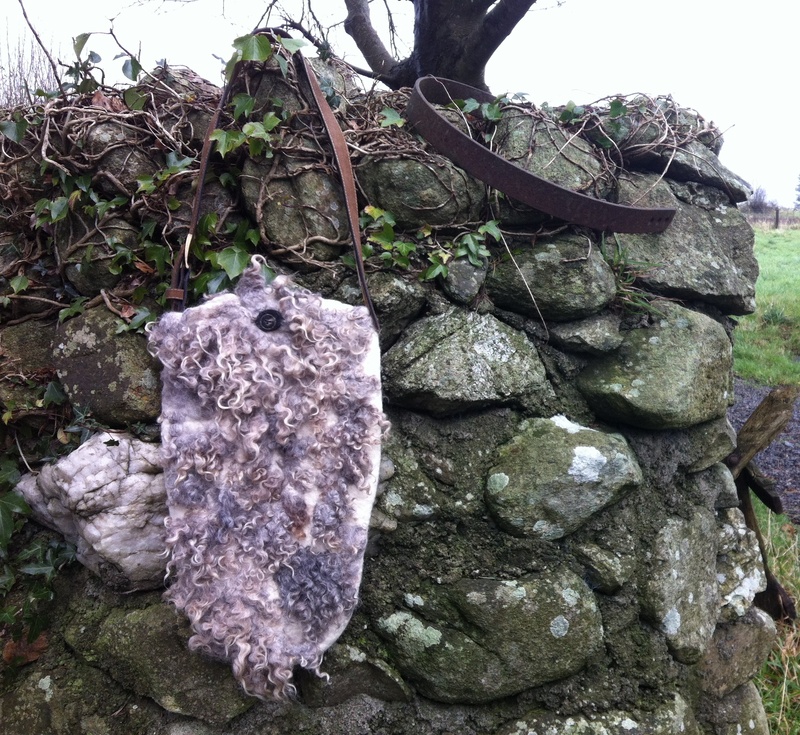 I’m totally addled now having spent the last number of hours adding finishing touches to some raw fleece and merino bags in preparation for the farmer’s market in Borris tomorrow morning. If it wasn’t for the fact that I really like the bag I was trying to attach the handle to I probably would have taken my sissors to it and cut it up into shreds! How anybody enjoys sewing is beyond me!!! Apologies to all of you who find it relaxing but honestly, at this stage you might think that I would be getting a little more proficient, scrap that thought totally. My only consolation is that I have decided to contact Ken Foley after Christmas and see if he would be interested in making and attaching handles to my designs, this way I can concentrate on the felting and leave the leather work to the master! The relief I feel after taking this descision is amazing, it may make the bags a little bit more expensive to buy but thinking of the time I’ll be saving I feel that it is going to be worth it in the long run. I also got to use some of my stash buttons; the bag pictured has a stunning horn button that I picked up in the United States two years ago and I also found the perfect vintage closure for a handy purse that has a loop at the back to wear around your waist with a belt. Head over to visit Clasheen on Facebook if you would like to see pictures of all the finished bags! 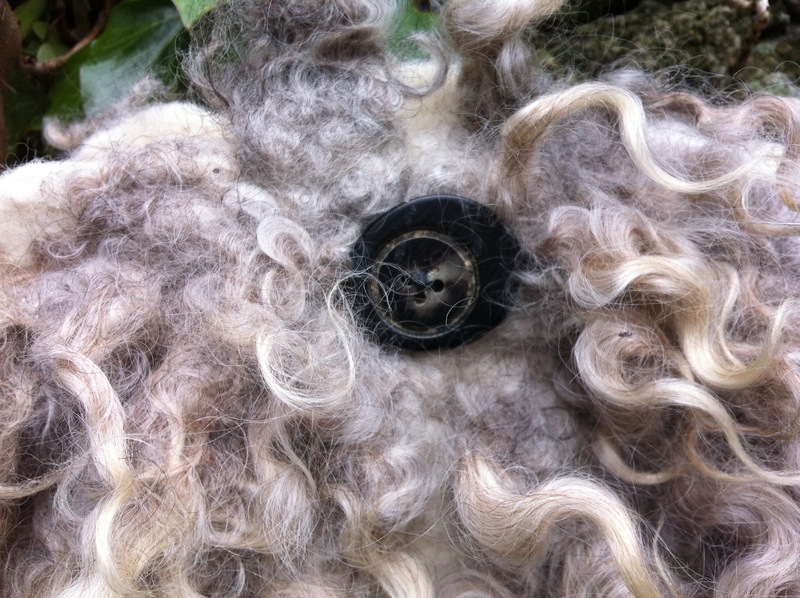 Gorgeous horn button nestling amongst the raw wool locks! This entry was posted in Craft Fairs/Events, Fairs/Events, Felt, Felt for sale and tagged Clasheen, Felt, felt bag, Felting, Jacobs fleece, merino, raw wool, wet felt, wet felting by Nicola. Bookmark the permalink. Nicola, ud es una gran artista y esta bien que deje que otros le ayuden y ud se dedique a crear las cosas hermosas que sus seguidores disfrutamos. Yo vivo en Chile, estoy aprendiendo a trabajar con lanas y lo que mas me gusta es el fieltro. Soy muy feliz aprendiendo de mis amigas que saben mas que yo, cariños, Susana. I had visions of the two us spending quiet, solitary evenings at your place stitching the hours away, you occasionally beckoning to me, “Dawn, tighten those stitches up a bit! You’ll be much happier with the finished product.” Whew!!!! What a relief!!!! Lovely color variations on those gorgeous locks, Nicola! I’m glad you didn’t snip it up.